Santana provides excellent filtration products for your pool and spa water cleansing needs. Filters Fast carries a number of pool and spa replacement filters to fit various types of water purification and filtration systems. Santana provides excellent filtration products for your pool and spa water cleansing needs. 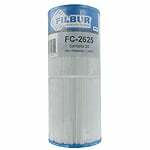 The Filbur FC-2625 is a compatible replacement spa filter cartridge for the Santana 30 Spa Filter. This Santana compatible filter replacement will fit all spas, jacuzzis, hot tubs, and pools which use a Santana 30 filter.